Arthur Pewty's maggot sandwich: An invasion of foxes. The photo above might initially not look very interesting, but it has provided a somewhat contentious site for one of Erith’s most disruptive sets of roadworks within recent memory. You may recall that back in June I wrote about the huge and extensive road works which were carried out in Manor Road, Erith. The road was closed for ten weeks whilst it was completely re- engineered, as it had been in a state of near collapse for several years. Manor Road is nearly a mile long, and the section between the KFC drive through and Appold Street was the first to be dug up. 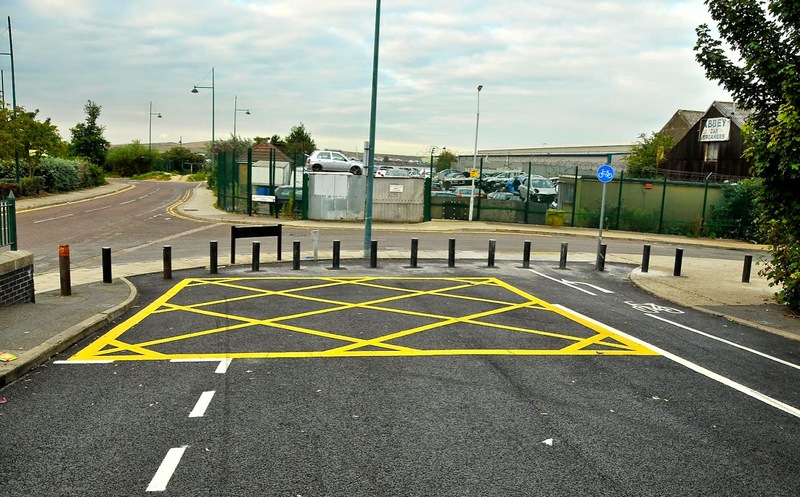 Bexley Council Highways Department had devised a diversion via Slade Green, which had been locally published a week or so prior to the start of the closure period. Some devious drivers who know the area very well realised that there was an illegal cut through which would avoid having to use the diversion. Instead they drove along James Watt Way (the road that runs around the outside of Morrison’s car park) and then up Appold Street and past the road works. For many years the junction of James Watt Way and Appold Street has been a no – through – road, with a number of bollards blocking the way. The reason for this is that Appold Street is a quiet residential road, mainly populated by small Victorian cottages whose front doors open directly onto the pavement; any increase over normal local traffic would be disproportionately detrimental to the lives of local residents. The problem always was that the bollards were too few in number, and too widely spaced, meaning that smaller cars and vans could squeeze through the gaps, and for many years one could see vehicles illegally cutting through in this manner. Once the road works began, the increase in traffic via this route was phenomenal, to the point where there was a queue in each direction to get through the gaps in the bollards. Vehicles were revving their engines and hooting their horns in frustration, and I witnessed a couple of incidents of road rage. All this badly affected the residents of Appold Street. After a couple of days things went further downhill. The road contractors removed a couple of bollards and allowed the illegal traffic to move more freely – though it still was only one vehicle per time through the resultant gap. The drivers understood this barrier removal to mean tacit approval for the unplanned diversion work – around, and thus the traffic levels increased still further, making life for people living in Appold Street a nightmare. There were two reported incidents of toddlers being hit by cars on the cut – through, though fortunately in both cases there was no serious injury. I was one of many people to complain to both the Police and the Council about the situation, and I had an Email from the borough Chief Engineer, who had witnessed a number of incidents during a site visit. The results can be seen above – click on the photo for a larger view. Soon after the road works were completed, began on improvement works in Appold Street. The cut through has now been completely sealed to all vehicles except motorcycles, push bikes, prams and buggies, which is as it was always intended, and the resulting disturbance to those living in Appold Street has been reduced to a minimum. It does go to show that complaining can have a positive result. Recently, Malcolm Knight of the “Bexley is Bonkers” blog wrote an account of a visit he had made to a Bexley Council meeting where the various Council budgets and incomes / outgoings were debated. The council use auditors Grant Thornton to advise them on matters pertaining to finance. In the course of my day job I have had the odd occasion to deal with Grant Thornton staff, and in my experience they are very sharp cookies and very good at what they do. They have advised the Council that at present only 66% of residents pay their council tax by direct debit. Many of those who are listed as paying by other methods effectively do not. This leaves a very big hole in the Council finances which ends up being recouped by cuts to services, or an increase in the council tax; as we know, Bexley Council are philosophically opposed to increases in the council tax - as they know that this is a vote loser, and they don’t want to lose their cushy and excessively well paid jobs. The result has been the permanent cancellation of the Bexley Festival, the loss of “Bexley in Bloom” and a host of other projects and services. The reason Grant Thornton came up with the figure is that compared with other similar boroughs such as Bromley, Bexley has a very high transient population, and a very high percentage of privately rented housing. People move into the area, privately rent, don’t register with the council, pay no tax, and by the time anything is done to try and get them to pay, they have moved on elsewhere - quite often another address still in the borough, and the cycle continues again. The people who do this are often part of the black economy - they pay no income tax or national insurance, and effectively live as close as possible to “off the radar”. Personally I don’t think there is a huge amount the Council can do to address the problem at a local level; this is the kind of issue that has to be dealt with as a national issue, as it is happening all over the country. The only way to deal with the black economy is to recoup the missing money via taxes that they cannot avoid - by using an increase in taxes on products and services to compensate. In so doing you could remove a whole level of council and national insurance taxation and remove a level of bureaucracy from local government, thus saving in administration costs. What do you think? Leave a comment below, or Email me at hugh.neal@gmail.com. Long term Maggot Sandwich readers will know that I am a particular fan of the Google Chromebook range of computers. They are cheap, lightweight and surprisingly fast laptops which run a cut down version of Linux called Chrome OS and the Chrome web browser. They are not a full replacement for a machine running OS X, Windows or Linux, but a cut down laptop that just runs the Chrome web browser. You can watch YouTube videos, send and receive web based Email such as Gmail, use FaceBook, Instagram or any other web based service. You can also use Google Docs or other third party web based productivity tools. If you are happy with your data being stored in the cloud, a Chromebook may be ideal for you. They are certainly fast; my Chromebook boots from cold to the logon screen in eight seconds flat. They are also good, if like me you don’t get on with tablet computers – I have a Samsung tablet that belongs to work; I certainly would not buy one, or an iPad personally. I need a decent keyboard, and Chromebooks have excellent ones. Until recently the big drawback with Chromebooks has been that certain heavy duty applications such as Microsoft Office and Photoshop don’t work on them, as you are unable to locally install applications. This is starting to change; not only have Microsoft launched Office 365 – a web based version of MS Office, which can run in a web browser, and now software giant Adobe have announced a version of Photoshop which is designed specifically to run on Chromebook computers. On Monday, Google and adobe jointly unveiled "Project Photoshop Streaming," an effort to get Adobe's flagship photo editing software running inside browser windows via application streaming. "This streaming version of Photoshop is designed to run straight from the cloud to your Chromebook," Google's Steven Konig said in a blog post. "It's always up-to-date and fully integrated with Google Drive, so there's no need to download and re-upload files – just save your art directly from Photoshop to the cloud." What's more, Konig said, streaming makes managing applications like Photoshop easier for IT system administrators, because there's no client software to install or maintain on individual users' machines. The bad news is that this project is initially confined to North America, and further confined to educational users. I have the feeling that once the word gets out, the demand will be so great that Google and Adobe will have to release to a world – wide audience. This good news comes shortly after Google announced a project to get popular Android applications to run on Chromebooks via a virtual machine with no perceptible loss of performance. Google are heading for a major head to head with Microsoft for the future of the desktop, and the outcome will be fascinating. Whichever way it goes, it will be good news for the consumer. I have written in the past that in my opinion the days of having heavy duty PC’s with huge processors and expensive memory are likely to become a rarity. Most users will do what they are already doing – using a web browser to access an application that sits in the cloud, on high powered servers that do all of the “heavy lifting” enabling smaller, lighter and far less power hungry mobile devices to carry out the user interface; it would seem that this is the way things will head in the future. Recently I have been watching a lot of episodes of “Old Top Gear” on YouTube. Some of you may recall the original, long running TV series, prior to its incarnation as the Clarkson / May / Hammond jokey blokey show that it has been on air in the current format since 2002. Many people don’t realise that the show had been produced in a more conventional format on BBC2 since 1979. I recalled watching the old version of the programme, and my memories were of a somewhat staid and boring presentation style. When I watched a dozen or so clips on YouTube, I found that the programme was excellent and very entertaining. It certainly had humour - see what I mean by watching the clip above. It just shows how memory can play tricks over time. Now for something a bit more sombre. 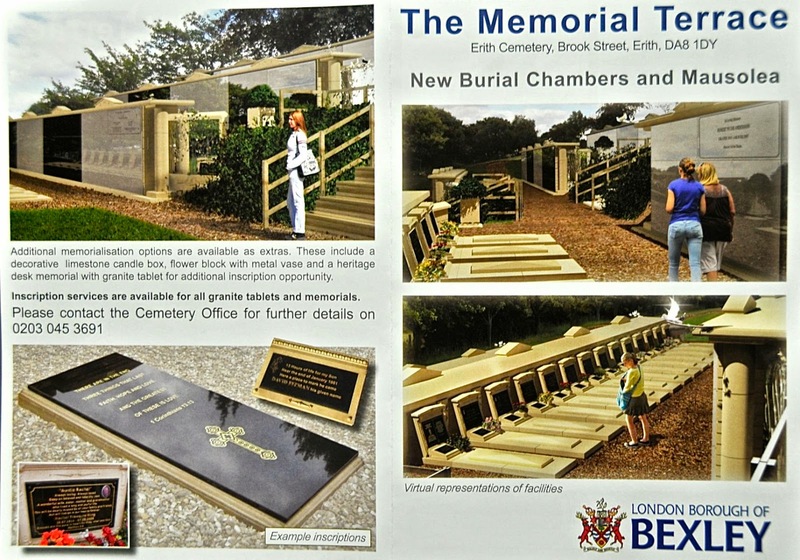 I have discovered the owners of graves in Erith Cemetery in Brook Street are being contacted by Bexley Council’s cemetery officer (I did not know that we had one) to inform them that the next phase of work to create a new Memorial Terrace has begun. A new mausoleum and double burial chambers have been installed. The letter states “Using a new specially designed and manufactured burial system it was possible to create burial spaces on the new side embankment, an area of the cemetery that was previously seen as being unsuitable for traditional earthen graves. 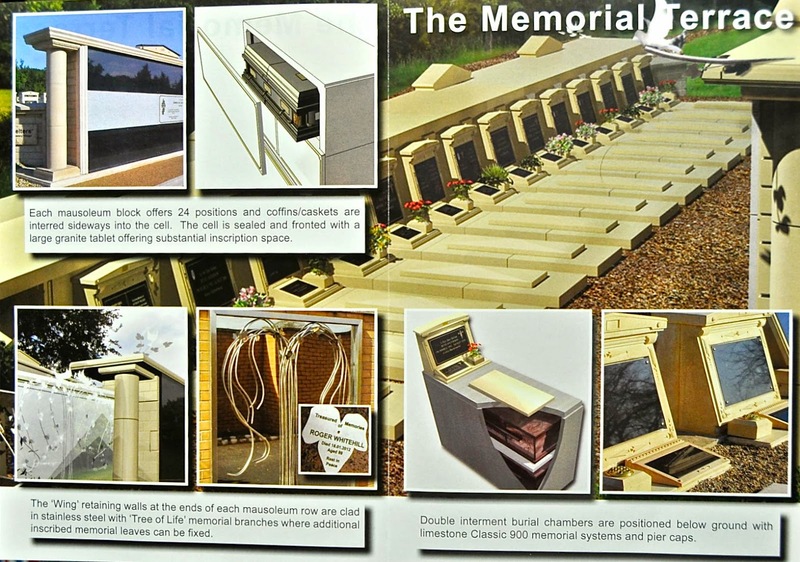 This bespoke system has made it possible to form the first of a series of terraces containing a selection of fully memorialised burial chambers, raised sarcophagi and a mausoleum for below and above ground internment”. The photos above (click for a larger view) show what the development is going to look like when it is finished. The Council do not state what prices they will be charging to interr your loved ones in the new chambers, but you can bet your bottom dollar that it is going to be very pricey – even a simple burial runs into thousands of pounds, and something far more ostentatious like this is going to be much more expensive. Until a year or so ago, I was entirely unaware that Erith was home to a multi – award winning singer and songwriter. It was only when the Bexley Times ran an article on a chap from Riverdale Road called Wayne Jacobs that I found out. Wayne has had three awards for songs he has written. One would think that he would be better known because of this, but outside of a relatively small sphere, he’s unknown still. The reason for this is not very difficult to understand. Music, like many things is a question of taste, and Wayne Jacobs writes and plays Country and Western music. Not something that is likely to find mass market appeal in South East London; there are a substantial number of people who like this somewhat unusual style of music in the area, but they are in a minority. I am quite surprised that Wayne Jacobs has not emigrated to somewhere like Nashville where his talents would be better put to use. Country and Western is a style of music that to my mind does not travel well. It is so intrinsically linked with certain parts of the USA that to my mind it has little relevance outside of it. It is good to hear of a local artist doing well; I just feel if he wants to hit the big time, he’s going to have to emigrate. What do you think? Am I being unduly harsh? Leave a comment below, or Email me directly at hugh.neal@gmail.com. The burglar who recently hid up a tree near Charlton Station, stopping all trains on the Dartford to London via Greenwich line for seventeen hours has been sentenced to eighteen months in prison. The London Evening Standard reported earlier in the week that Carlton Andre (36) of no fixed abode, caused the rail lines to be shut and 780 trains to be cancelled, costing nearly £500,000 in lost revenue and passenger compensation. Andre, clad in motorcycle gear and a balaclava, had used an angle grinder to cut open the shutters of a Curry’s store at Stone Lake Retail Park in Charlton, causing £1,500 worth of damage. When police were called he panicked and tried to escape empty-handed on a stolen motorbike. When the bike failed to start he fled on foot from police who tried to Taser him, before he hid in a garden shed. When Andre was located by a police helicopter he once again fled across live railway tracks before climbing a tree near Charlton railway station. The feckless scrote spent the night of the 16th, and most of the 17th August up a tree overlooking the railway lines; he was surrounded by Police and unable to escape, but for seventeen hours he refused to come down, and all trains had to be cancelled as a safety precaution, and the traction power had to be switched off. Fortunately the case made it to court relatively swiftly. Carlton Andre pleaded guilty to burglary, driving a car without the owner’s consent, and driving while disqualified at an earlier hearing. He also pleaded guilty to obstructing police, criminal damage and obstructing the railway following an attempted burglary at a commercial unit. Personally I think he should have gone down for longer, but nevertheless it does send out a strong message that if you compound your crimes by resisting arrest, then it will be reflected in the eventual sentence. The garden at Pewty Acres has had a major makeover this week; the lawn has been looking very sad and bedraggled for the last couple of years. It seemed to be more moss and clover than actual grass, and my efforts to restore it to health were unsuccessful. I seemed to spend more time trying to keep the lawn looking half respectable than I did enjoying it. As you may know, my “day job” involves applying technological solutions to all sorts of unusual business problems. I decided that I needed to take some of my own advice, and so I looked into how I could go about rectifying my ailing and somewhat unsightly grass. After some research I decided to go for broke and replace the lawn with a professionally installed synthetic replacement. You can see the results above - click on the picture for a larger view. Synthetic grass technology has come light years since the days of lurid bright green Astroturf, and the stuff they used to use in butcher’s shops meat displays. 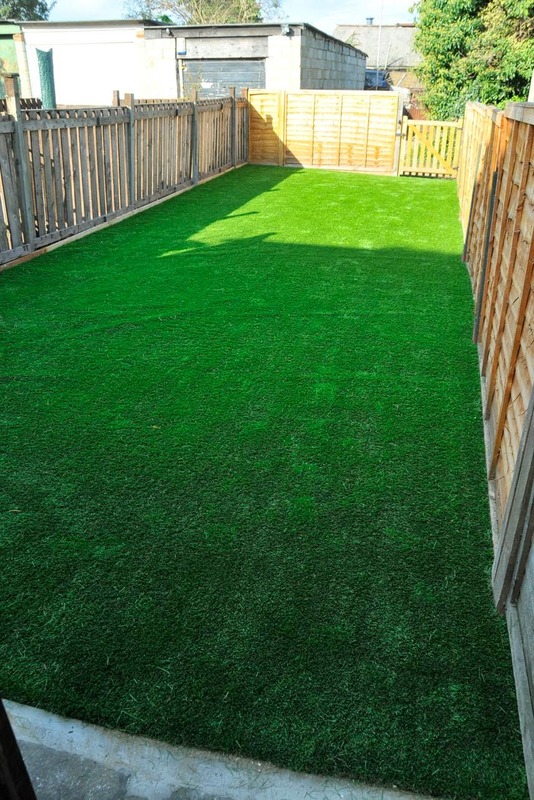 Modern synthetic turf is visually indistinguishable from the real thing; the individual blades of grass are made of subtly different colours and thicknesses, just as in real life. The supplier / installer I used guarantee their synthetic lawns for ten years against fading and staining. You can put heavy garden furniture and pots on the grass without causing any damage – about the only thing they do not recommend is using a wood or charcoal barbecue on synthetic grass, as dropped hot coals will melt and burn the surface. The installation of a full – sized lawn can take a couple of days. The installers begin by using a specialised turf cutting machine to remove the top layer of soil and old grass down to a depth of a couple of inches. Once this is done, A water permeable membrane is laid and secured to a wooden frame which is secured around the edge of the lawn area. Once this is completed, a layer of crushed granite chippings is laid and levelled with a Wacker plate. Then sharp sand is laid over the top, and rolled smooth with a large lawn roller. A second water permeable membrane layer is then laid on top and also secured to the wooden battens. Once this has been completed, the actual grass is then laid. Watching the work being carried out, it does strike me that the procedure is halfway between laying block paving and laying a carpet. I will report over time how I get on with the synthetic lawn. It is certainly not a cheap option, but I look at it as an investment. I have a handful of dead strimmers in my shed, along with an electric lawn mower that has seen better days. Over the minimum guaranteed ten year lifespan of the synthetic lawn, how much will I save in not having to purchase lawn care tools? I must admit that I have been somewhat sceptical when I have read accounts in the press of people encountering foxes in their houses, and the odd tale of foxes attacking small children and pets. My view was changed somewhat on Tuesday evening. I was sitting in my living room, watching old “Top Gear” excerpts on YouTube on my Google Chromebook (research for the piece I wrote above) and generally minding my own business. I noticed something out of the corner of my eye; when I looked up there was an adult fox standing in the middle of my living room! I was astonished – I did not think that a fox would be daring enough to enter anywhere that had a strong scent of human. I stood up and shouted at it – which it completely ignored. It was only when I moved toward it that it ran out of the living room and into the kitchen, where it picked up one of the pair of work boots I leave by the back door for wearing in the garden. It then ambled out into the garden and across my newly laid synthetic lawn. It was only when I ran at it waving my arms at shouting that it dropped the boot and ran off into some undergrowth near the bottom of my garden. Only a few hours earlier a fox (possibly the same one) stole a trainer from one of the lawn fitting team; he'd taken them off to change into builder’s boots whilst he prepared the granite chippings that formed part of the lawn base. He told me that he and his colleague watched as a fox came out of a bush, watched them for a minute or so, before snatching the trainer and ambling off as if nothing had happened. I know that an extended family of foxes are living on a small patch of waste ground near to Pewty Acres. The area has been home to foxes for many years, and up until recently humans and foxes have coexisted peacefully. What now seems to have changed is that the foxes have lost all fear of humans and are now encroaching where they are certainly not welcome. One of my neighbours has a small child, and I understand that they too have had foxes trespassing inside their house. Another neighbour told me that she too had several fox visits, even though she has a dog. I am afraid that repellents don't seem to be effective, and I am contacting a licensed pest exterminator to deal with the problems. I am fully aware that if you remove a family of foxes from an area, another family is likely to move in. The problem is not with foxes in general, but with this particular family, who have no fear of humans. My hope would be that any replacement fox family would be wary of people and leave us alone. Have you had any experiences of this nature? What did you do? Drop me a line to hugh.neal@gmail.com and let me know. The ending video this week is a short documentary about the history of Erith which was made by some pupils at Trinity School back in 2011. It is a very well produced look at the riverside town and the way in which it has changed over the years. Indeed, since the film was produced Warmlake Sports, the independent sport shop in the Erith Riverside Shopping Centre has closed, but other than that not much has changed. Do give it a watch and see what you think.